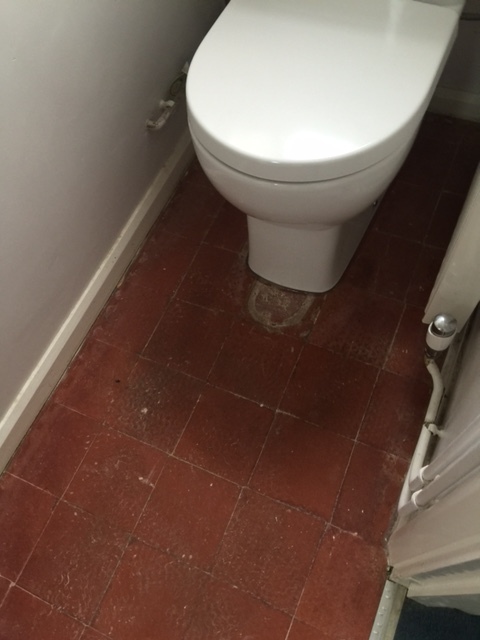 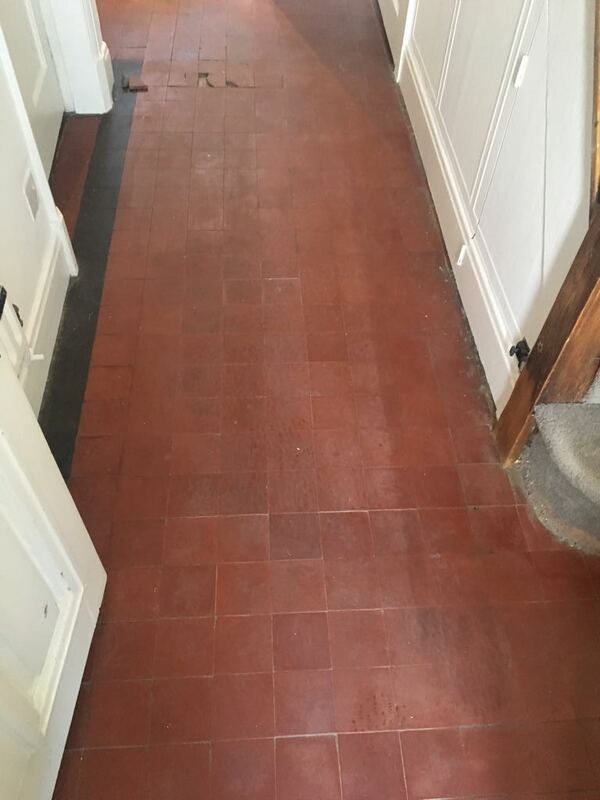 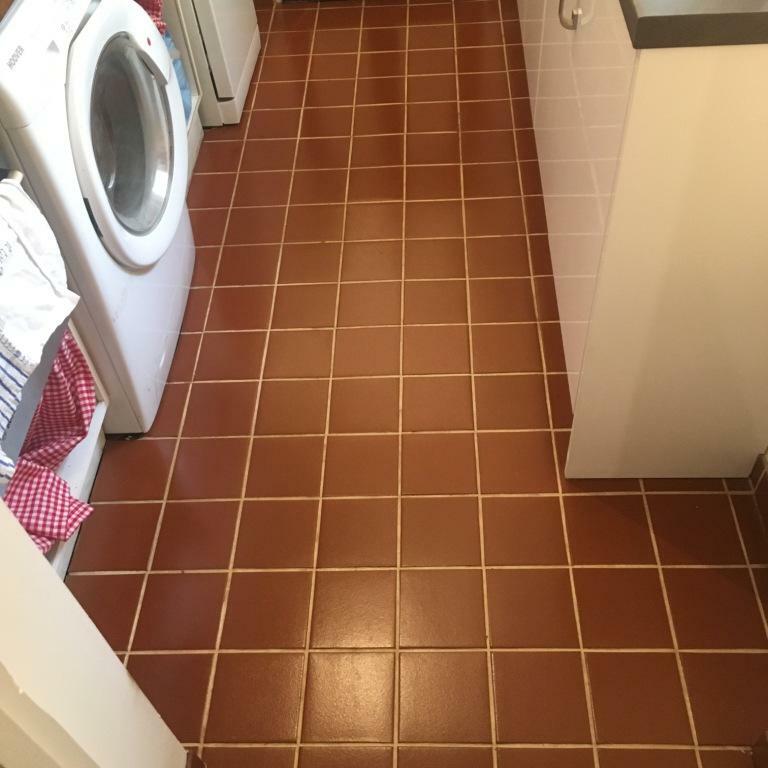 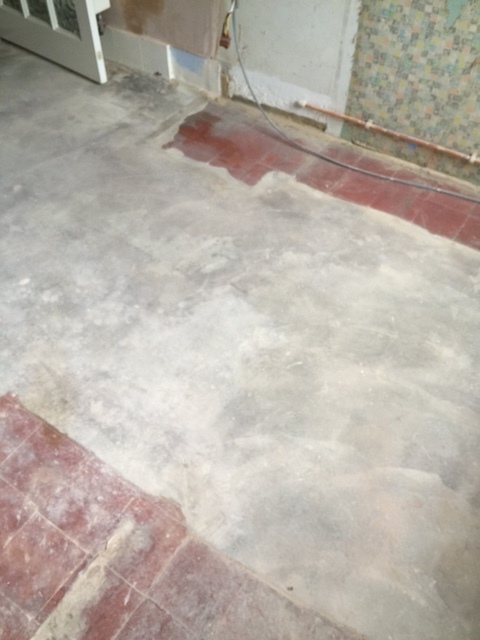 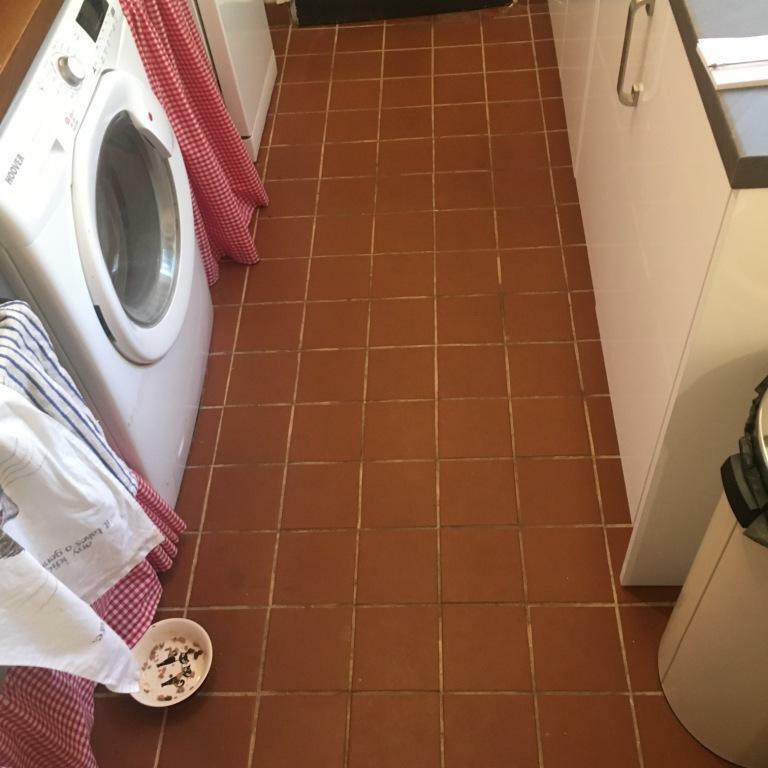 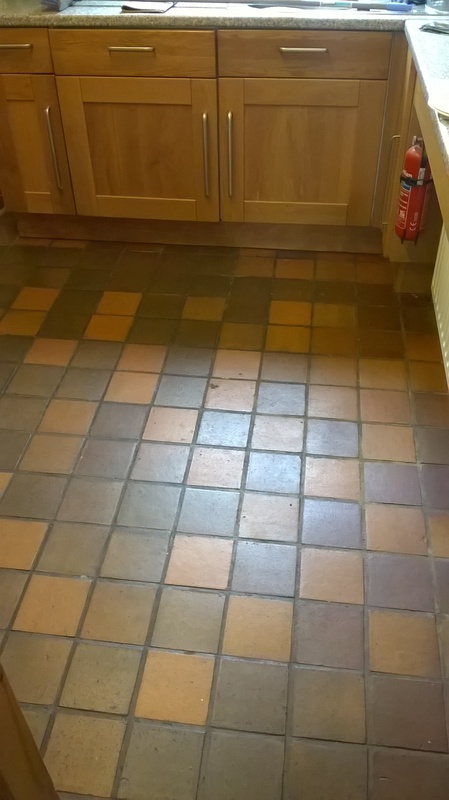 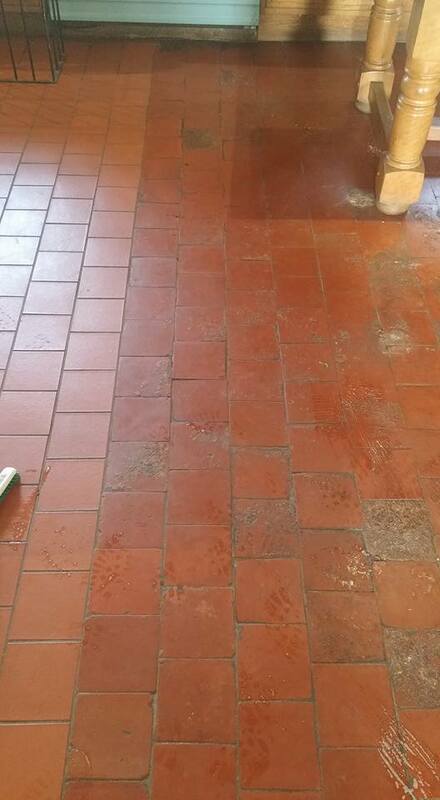 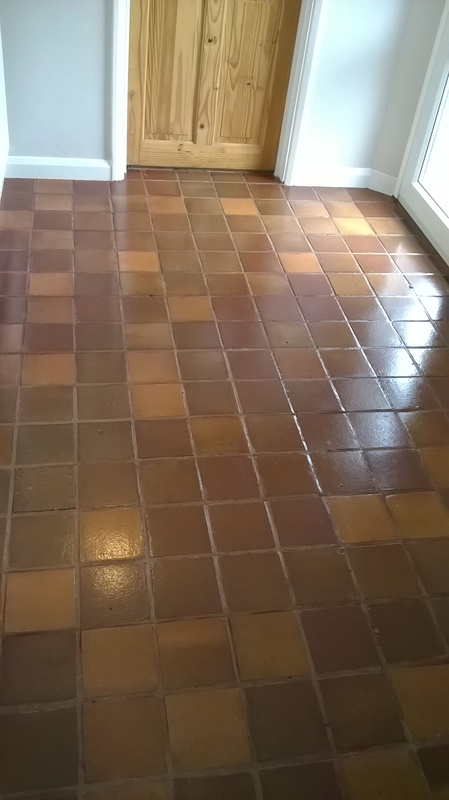 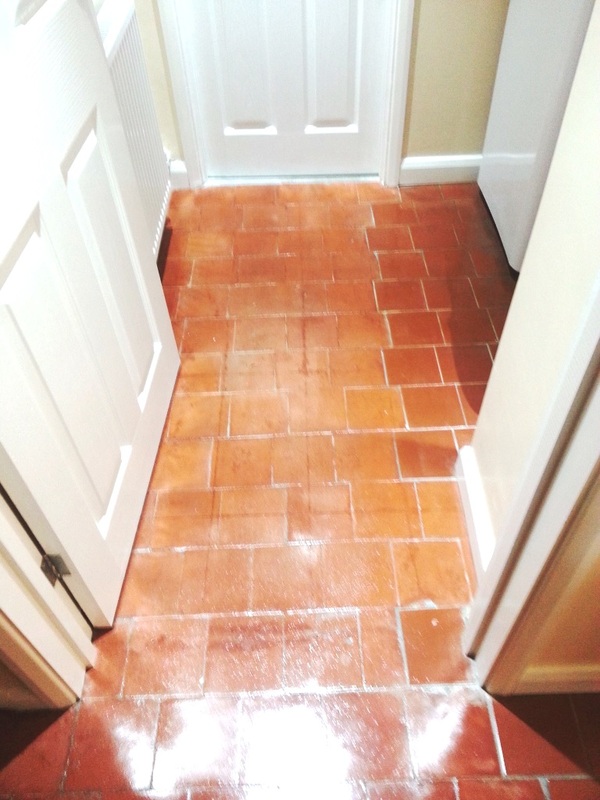 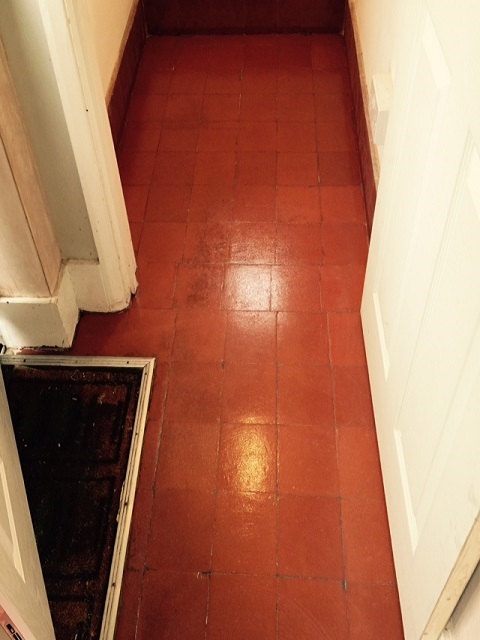 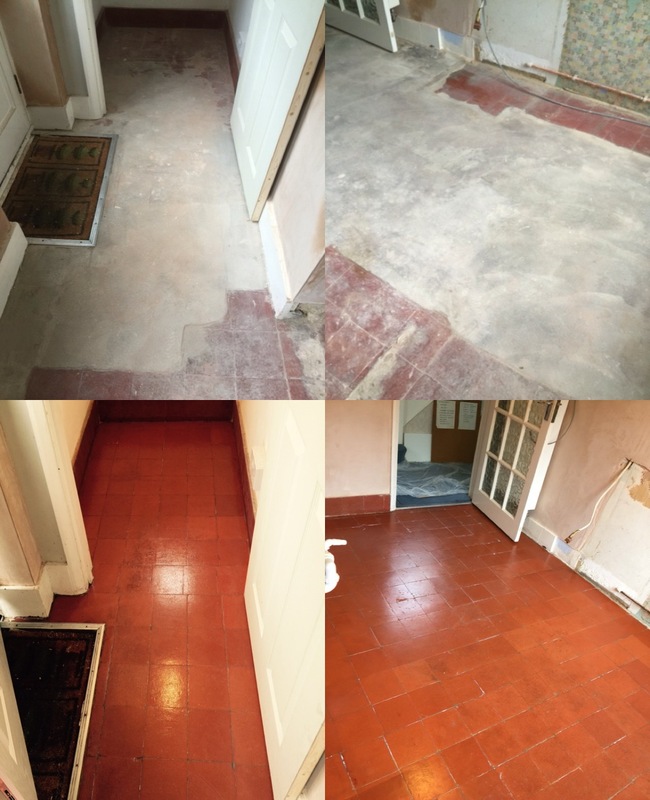 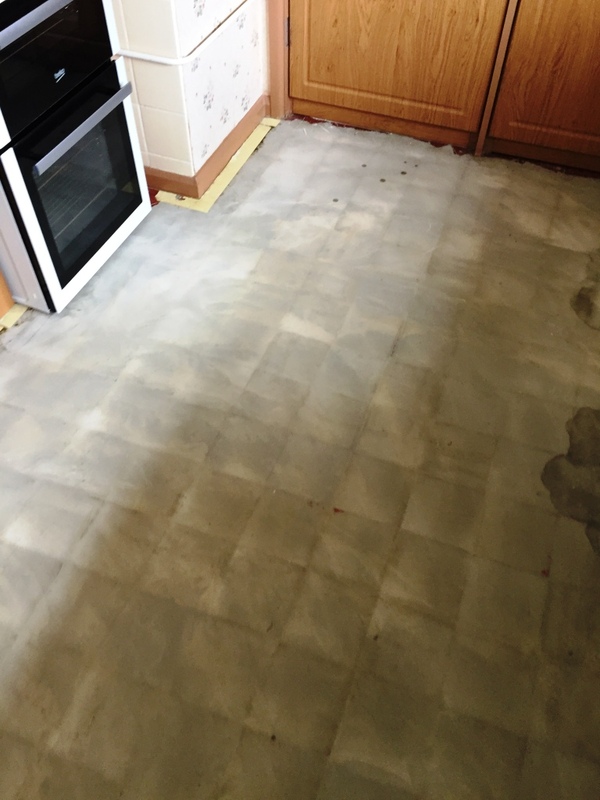 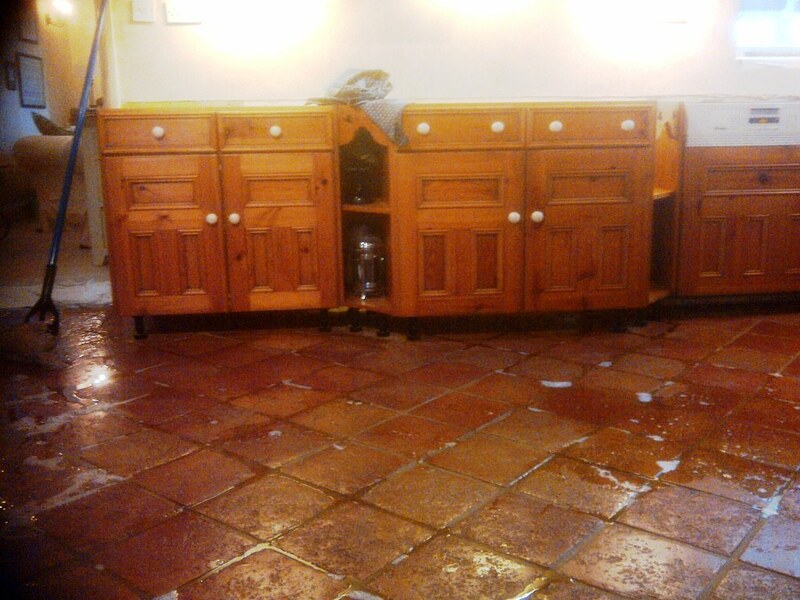 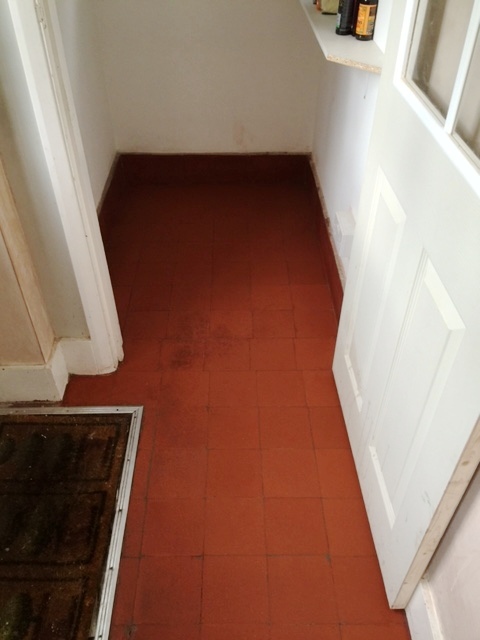 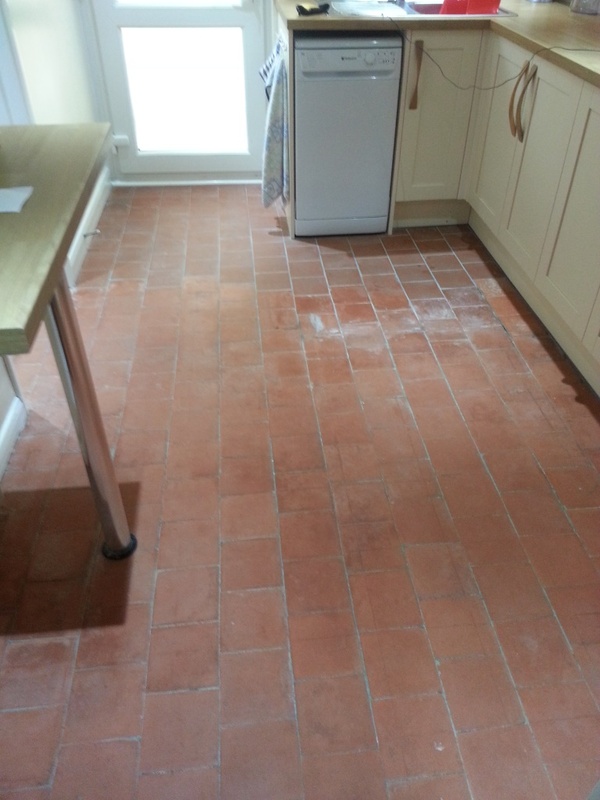 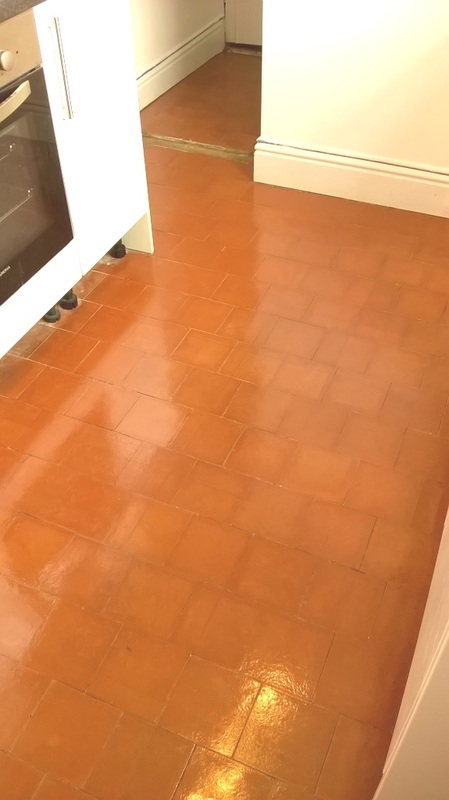 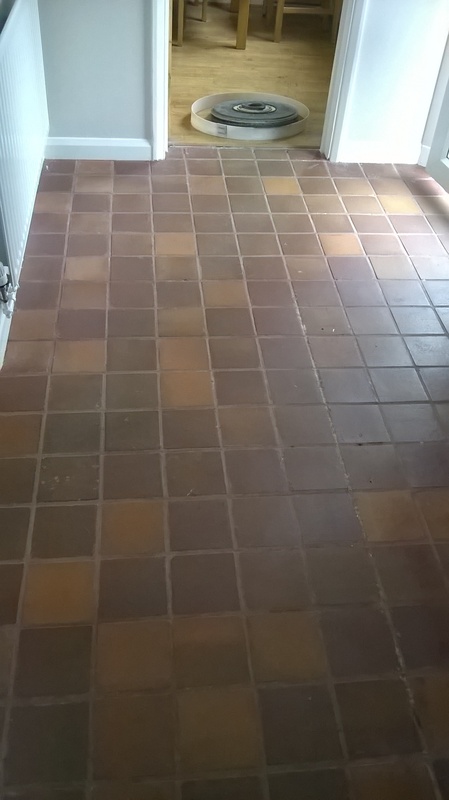 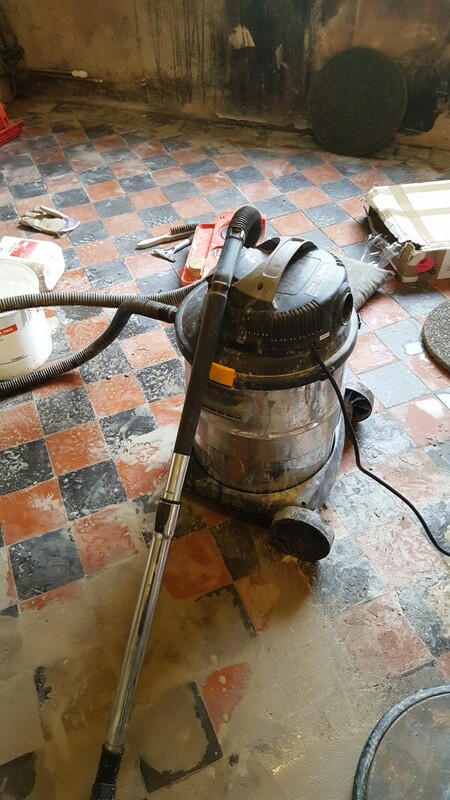 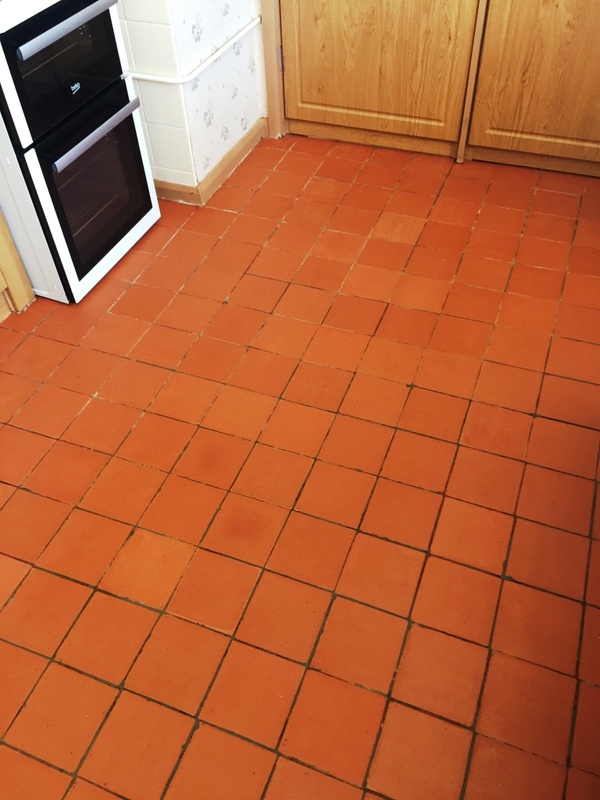 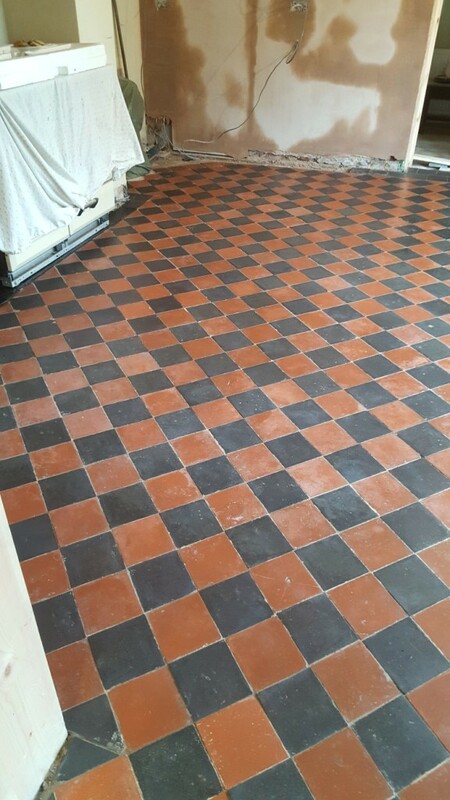 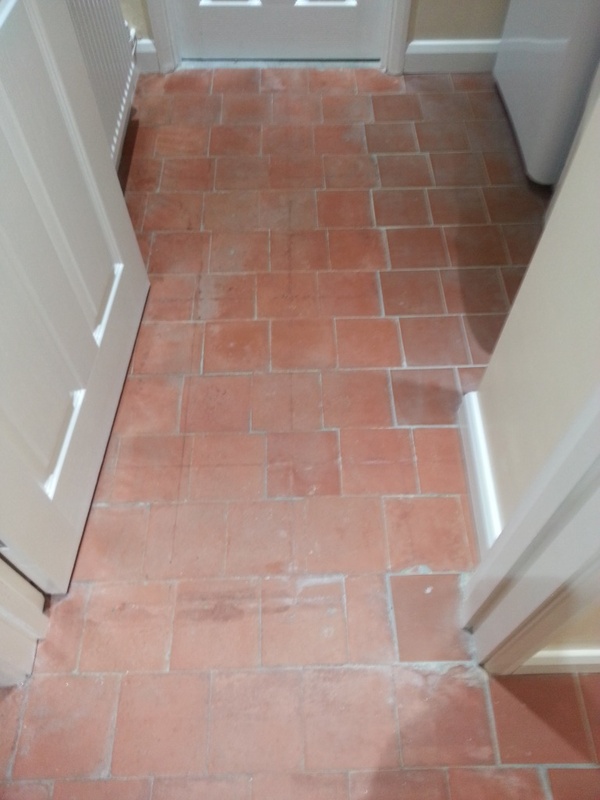 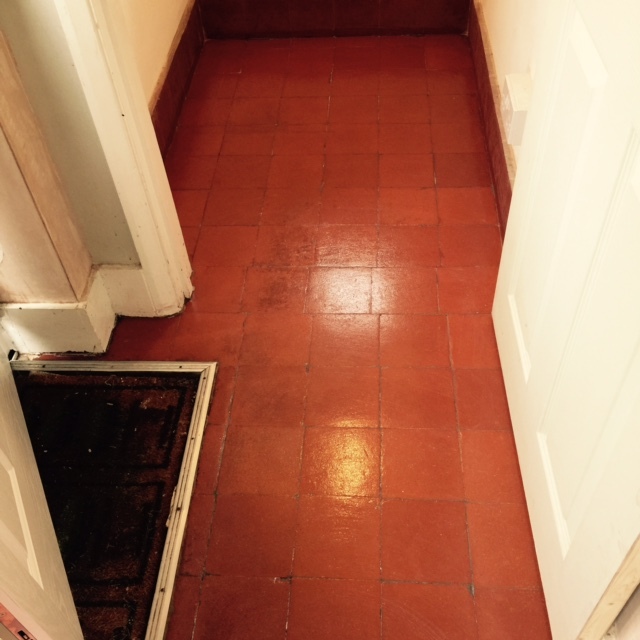 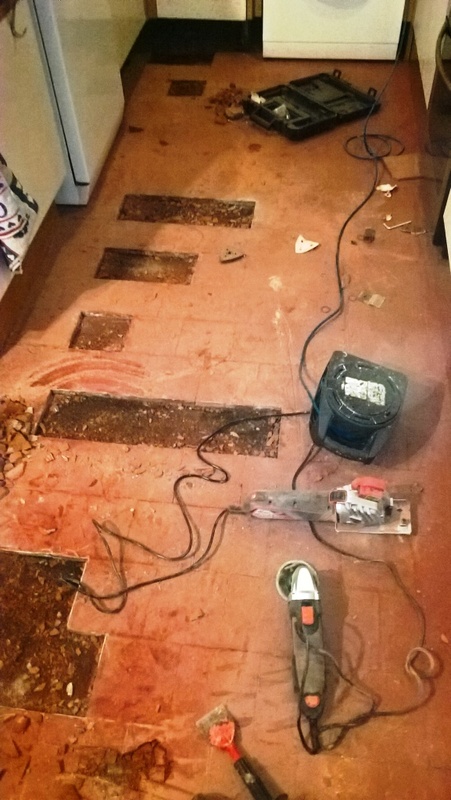 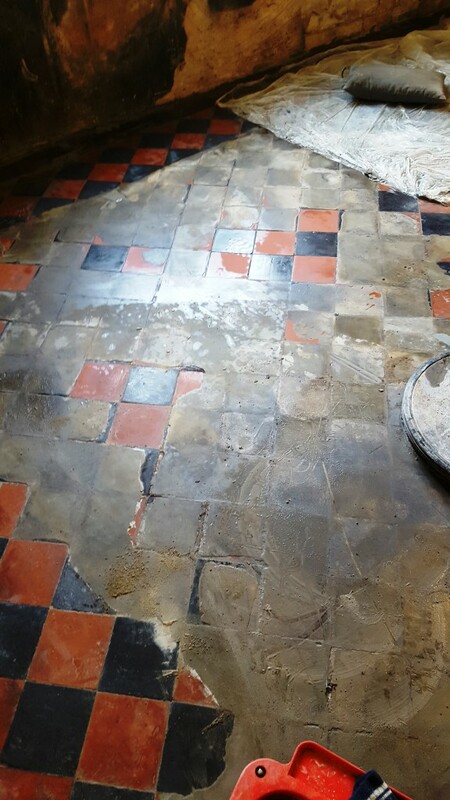 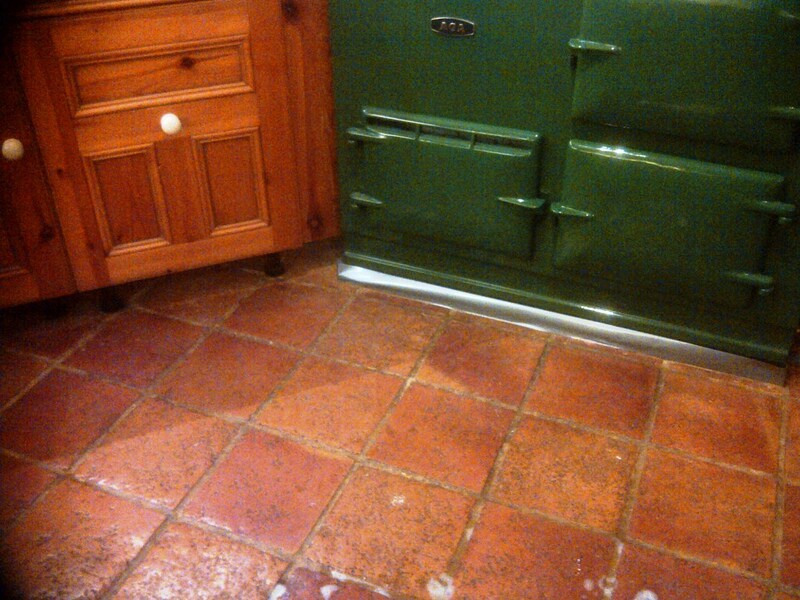 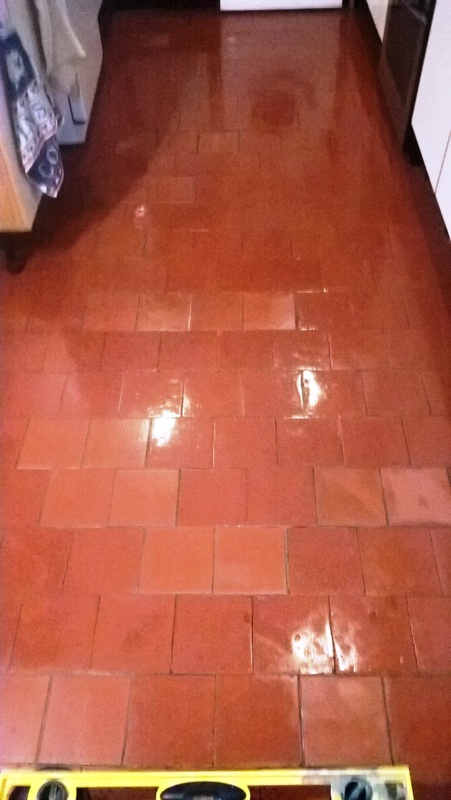 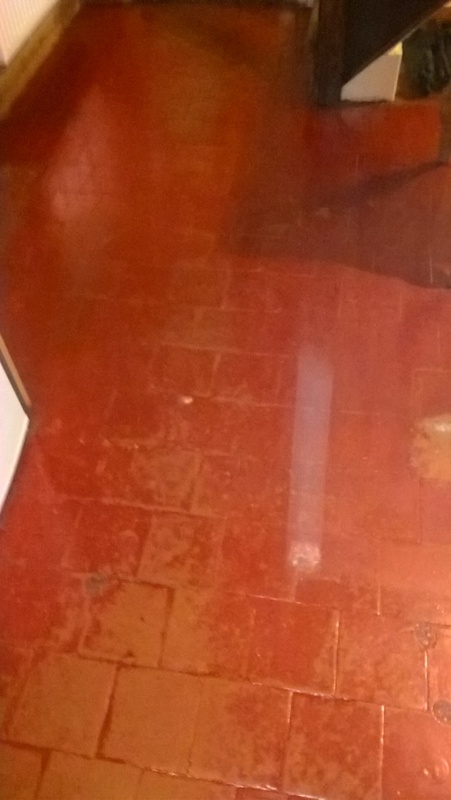 This was an unusual request in that this customer, in the small Bedfordshire village of Cople, had her Kitchen Quarry tiled floor cleaned and sealed six months earlier by another company. 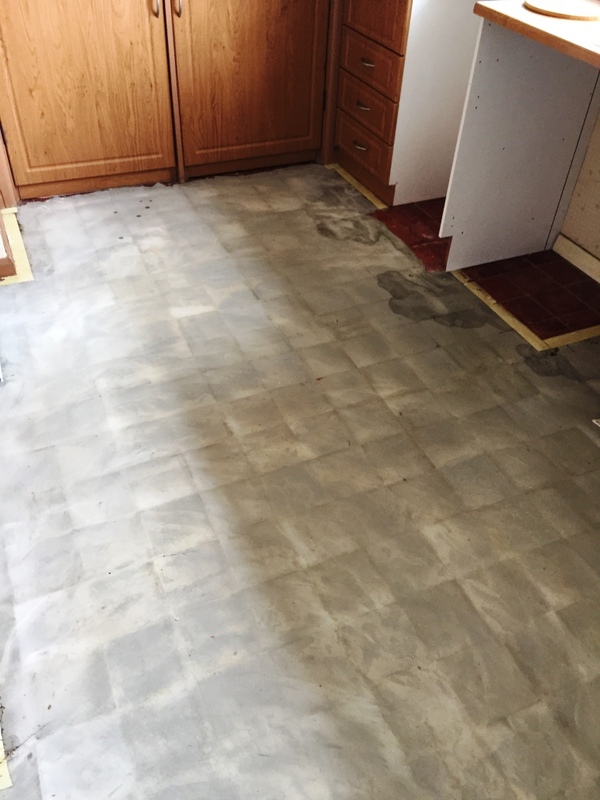 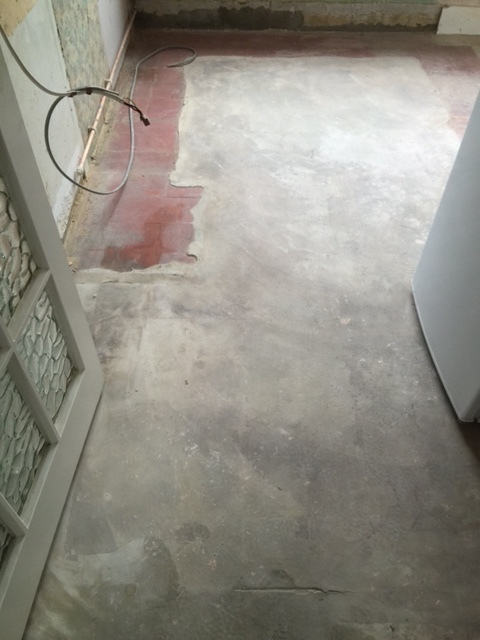 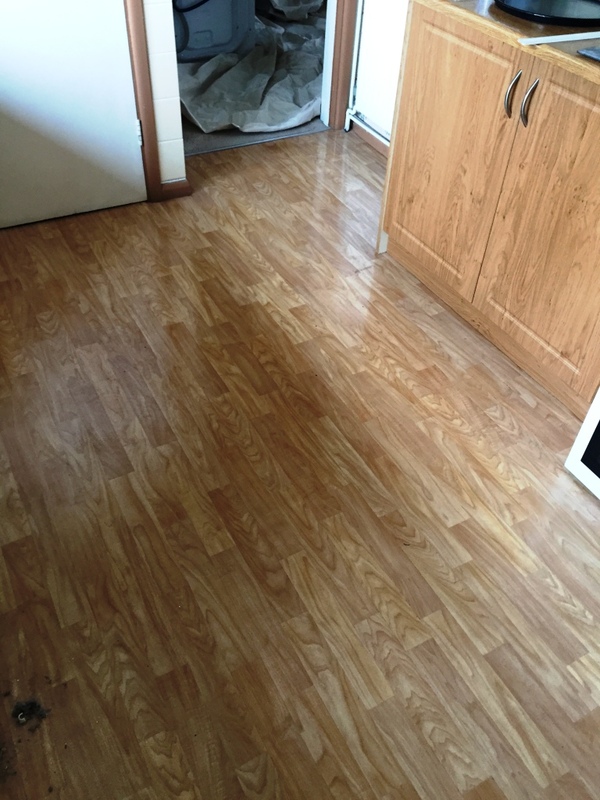 The sealer had come off and it soon became evident that after the work had been carried out the client was ill advised as to the correct maintenance of her floor. 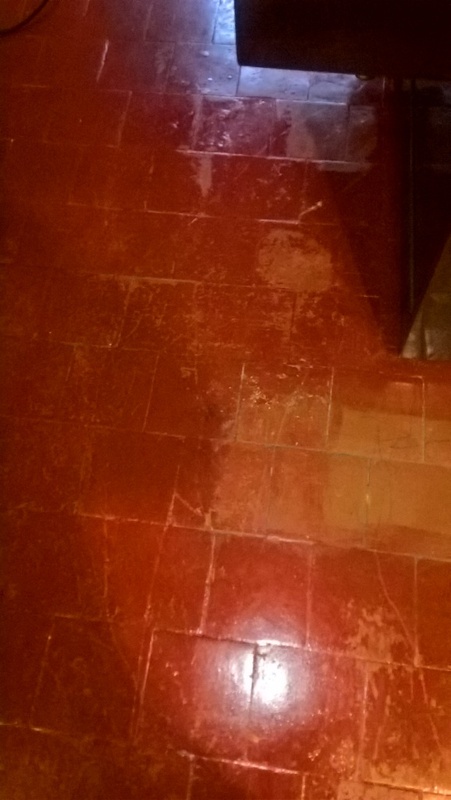 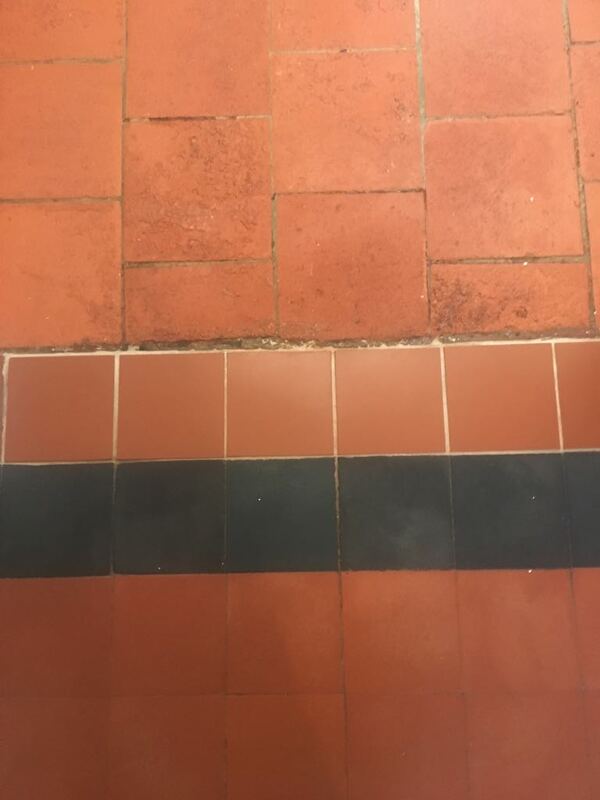 The cleaning product left by the previous company was totally unsuitable and over the course of six months she had managed in fact to slowly strip the sealer off of the tiles. 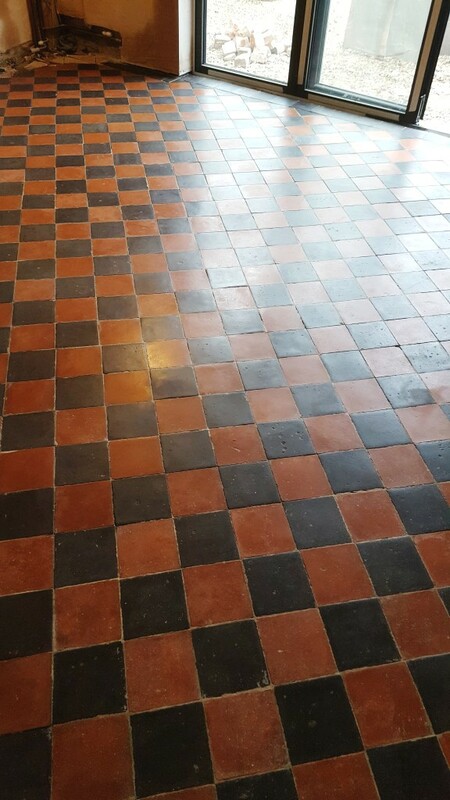 I soon realised the problem and advised that the only solution would be to strip any remaining sealer off the floor and re-seal, it’s generally not good practice to apply a different sealer on top of an existing sealer as there can be compatibility issues and the floor may look different in places where there are more layers of seal. 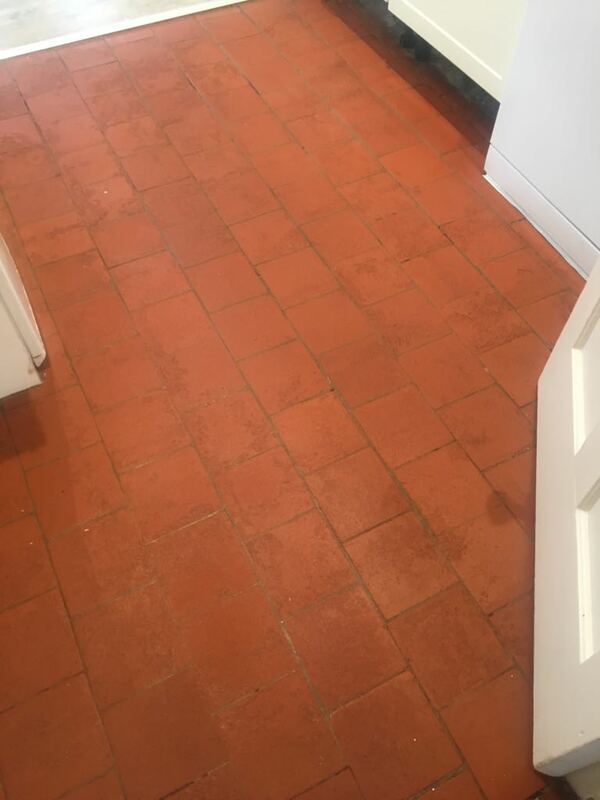 I used a strong dilution of Tile Doctor Pro-Clean to strip any remaining sealer off the tiles and clean them in the process, this involves spreading the solution over the tiles, allow it to dwell and soak in and then scrubbing the solution into the floor using a rotary machine fitted with a black scrubbing pad. 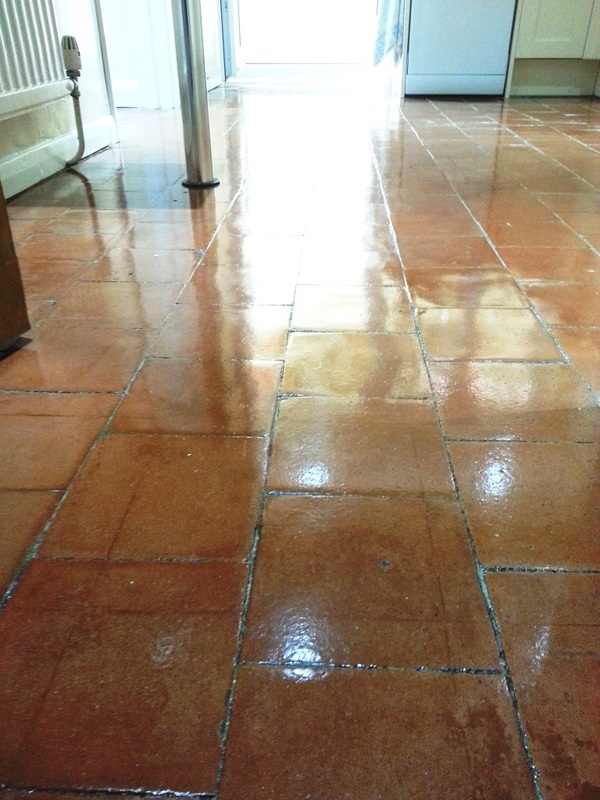 The floor was then rinsed with water applied with a mop and bucket and the soiled water extracted using a wet vacuum. 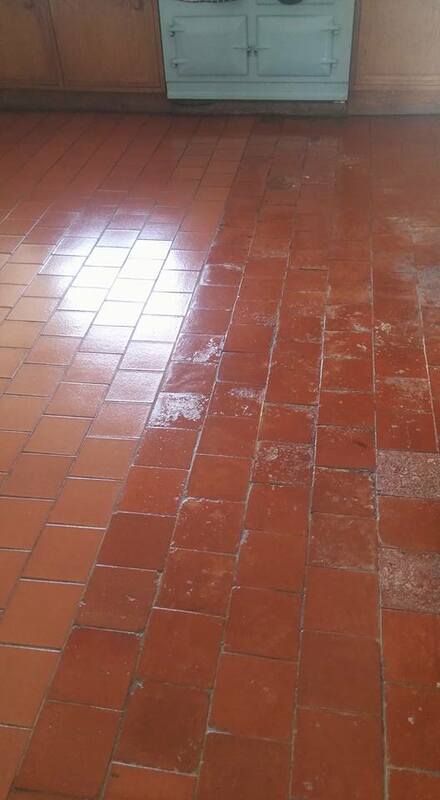 One the floor was clean I noticed there was evidence of concrete dust and grout haze on the surface of the tiles from when they were installed so I applied a another Tile Doctor product called Grout Clean-up to remove it, again the floor was thoroughly rinsed with water which was extracted the floor dried using air movers. 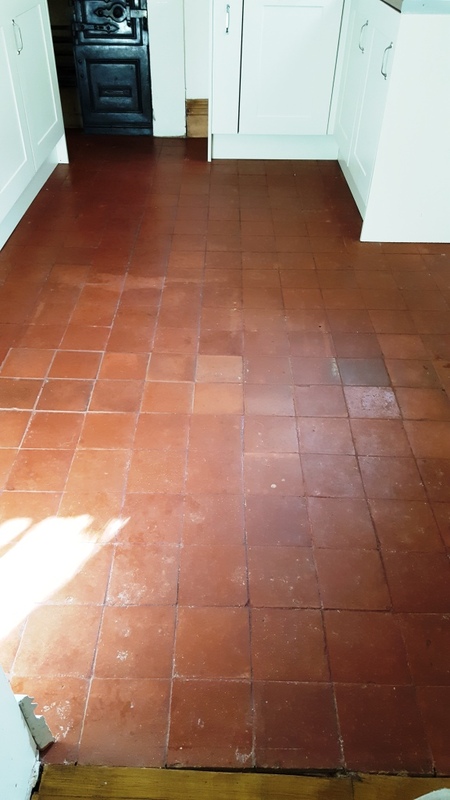 Tiled floors need to be dry before sealing and so I left this floor for four days to allow enough time for it to thoroughly dry out before returning to seal it. 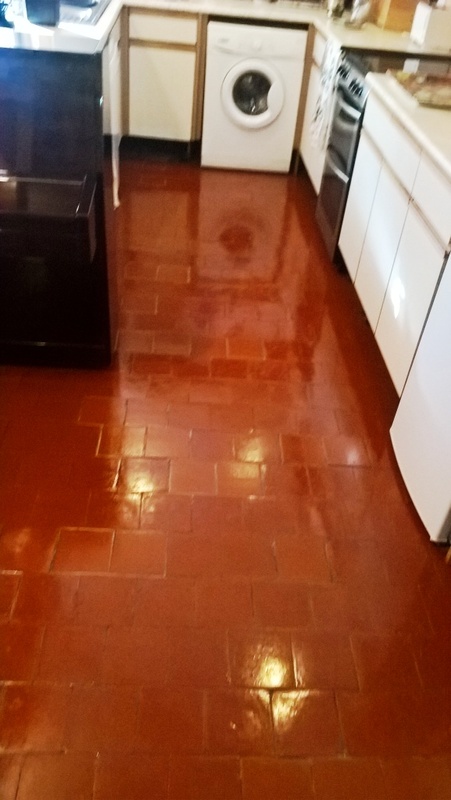 Choice of sealer for this floor was four coats of Tile Doctor Seal and Go which is a water based sealer so it doesn’t leave a smell and additionally adds a nice subtle shine to the floor. 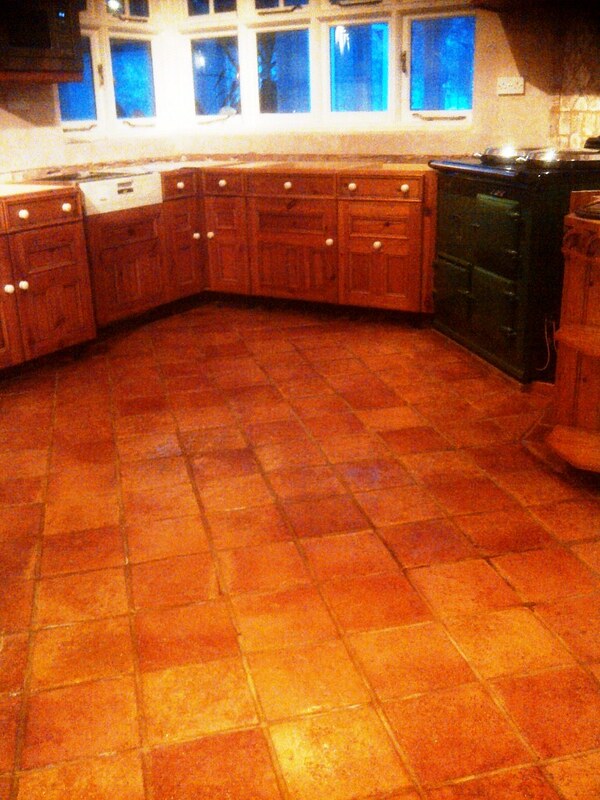 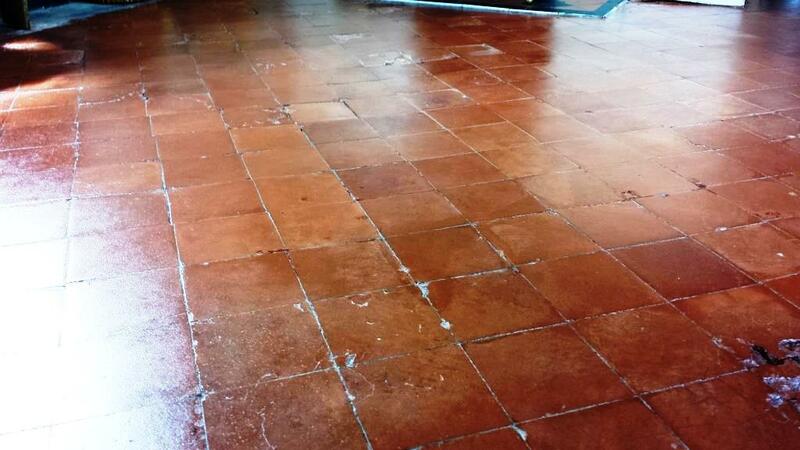 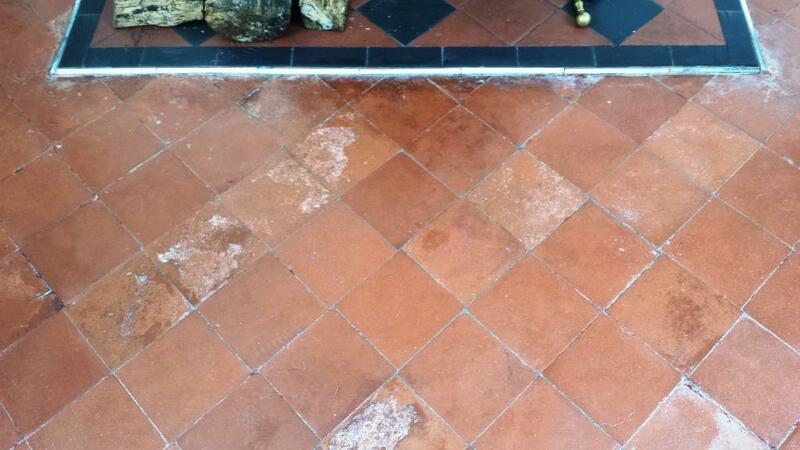 The difference was transformational as the sealer really does bring out the best in the quarry tiles. 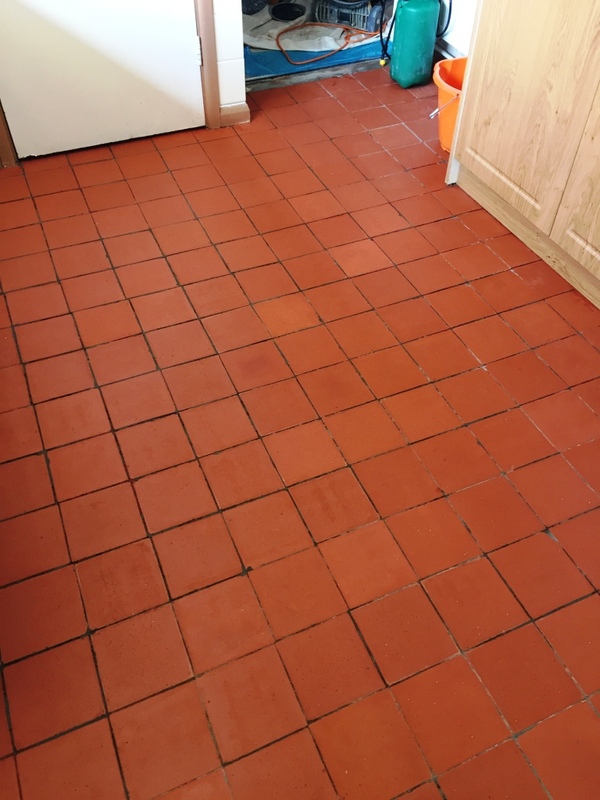 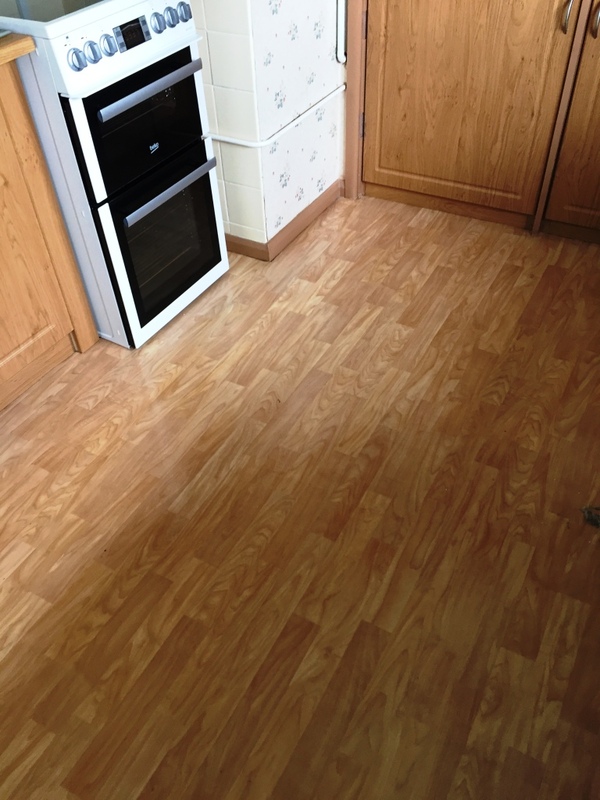 Before leaving we have provided the customer a bottle of Tile Doctor Neutral Tile Cleaner which is the correct cleaning agent to maintain a sealed floor. 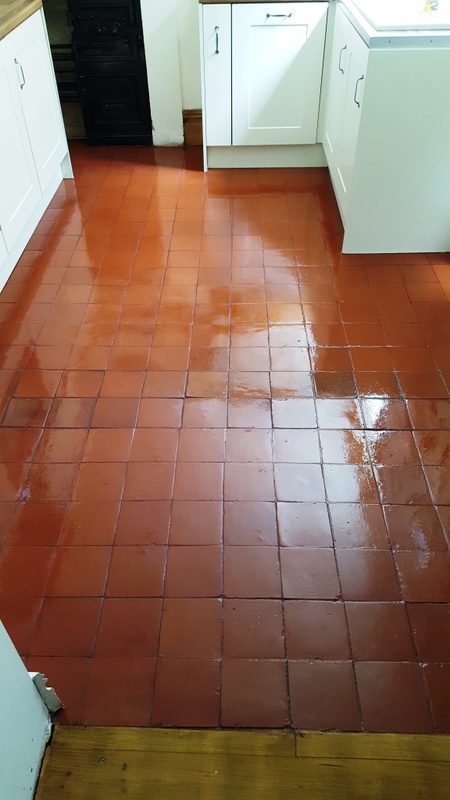 It has a neutral PH formula so it won’t erode the sealer like many of the acidic floor cleaning products you find in the supermarket which are really only meant for use on Vinyl or Ceramic tiles. 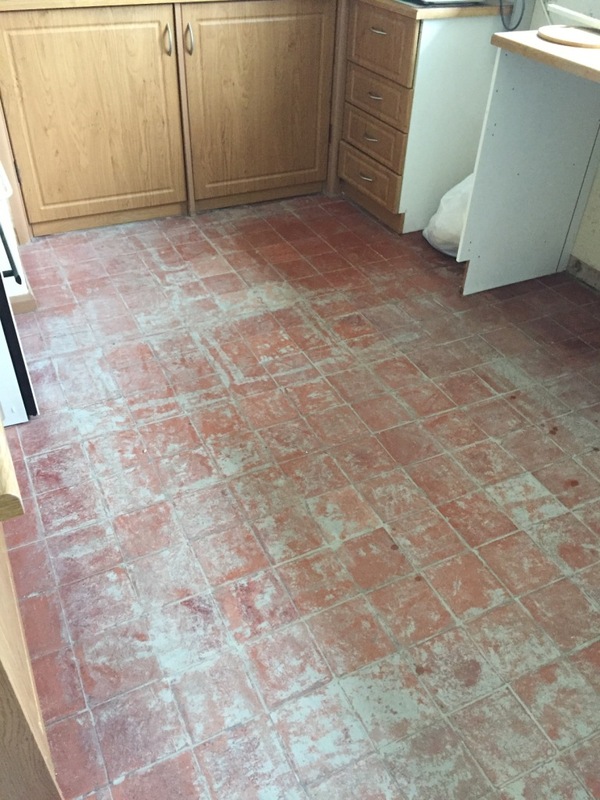 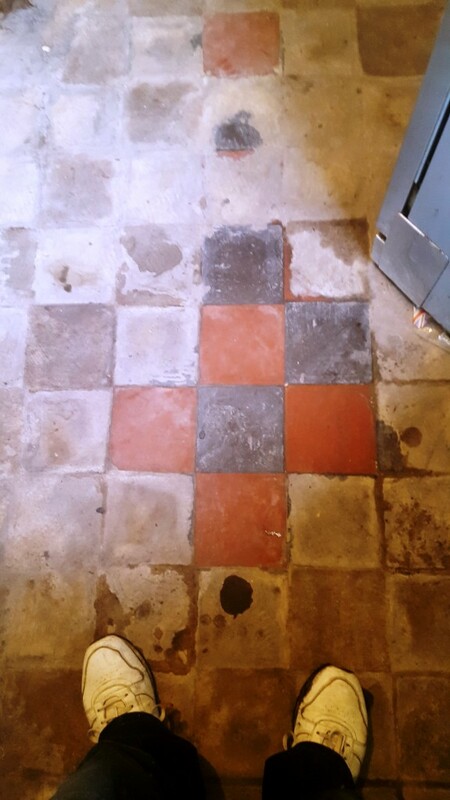 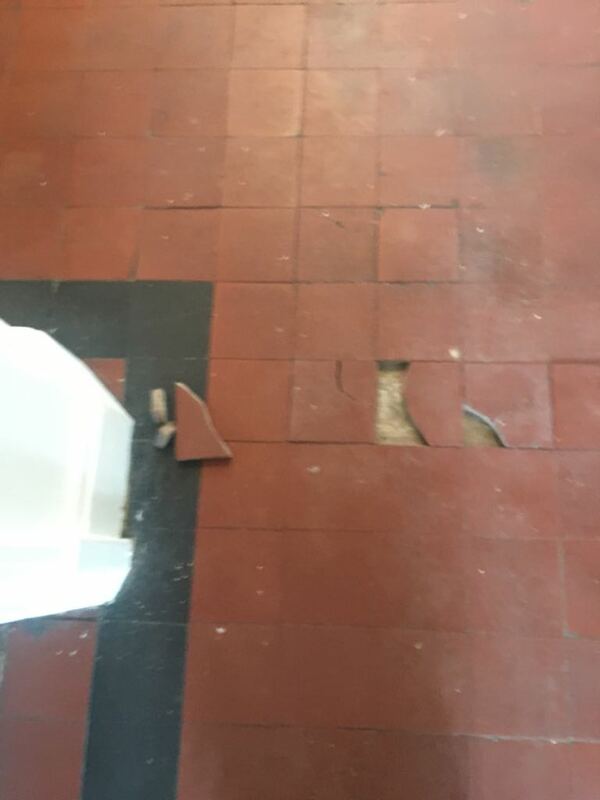 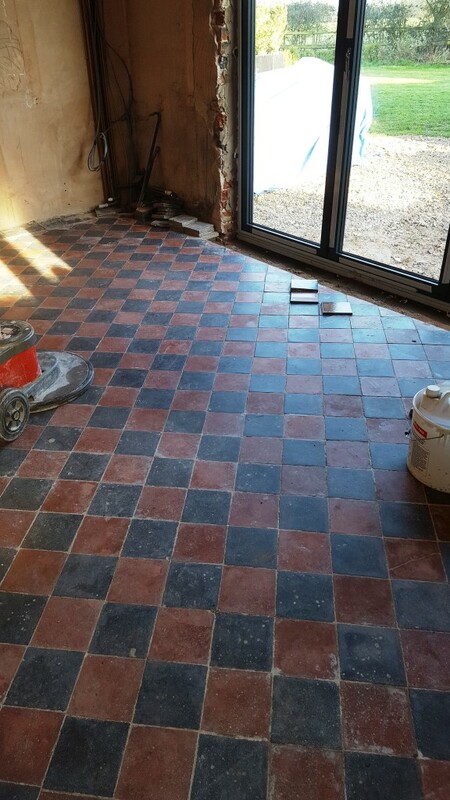 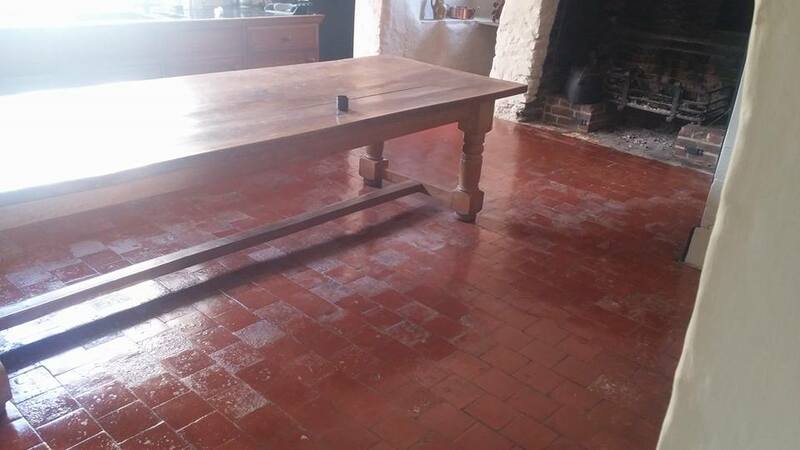 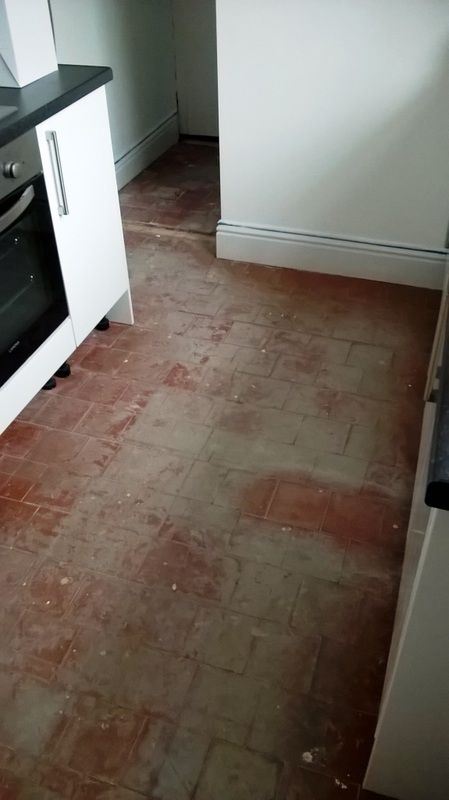 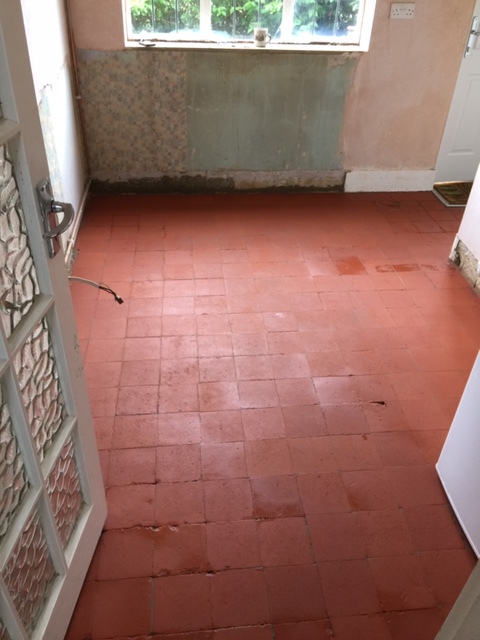 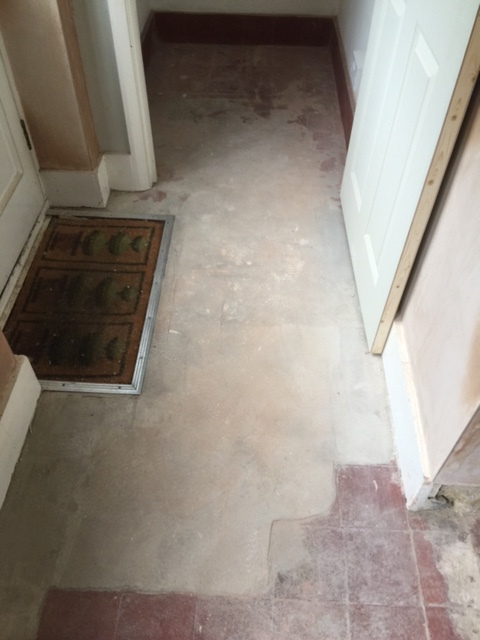 The owner of this residence near Caerphilly Castle had discovered a 150x150mm red Quarry tiled floor in the kitchen which dated back to before 1900 and had unfortunately been tiled over by a previous owner. 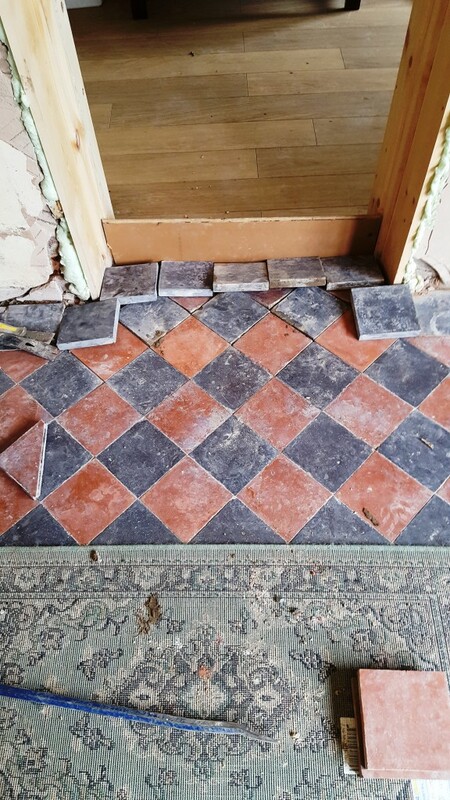 Keen on restoring such an original feature the owner set about removing the tiles on top using a chisel and scraping off the adhesive, it was at this point we got the call to assist. 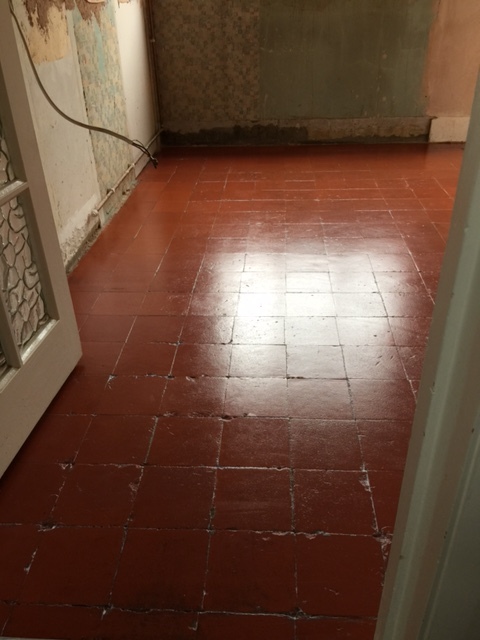 Before proceeding my first job is to always check the moisture levels, many of these old floors have no damp proof membrane so without taking a base reading it’s tricky to know if the floor has thoroughly dried later. 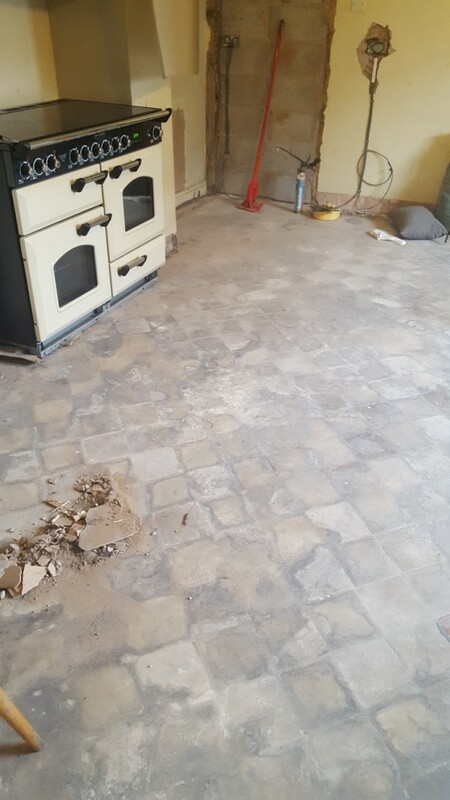 The kitchen was being replaced and the old kitchen had been removed so I was able to work on the restoration before the new one had been installed making the task easier. 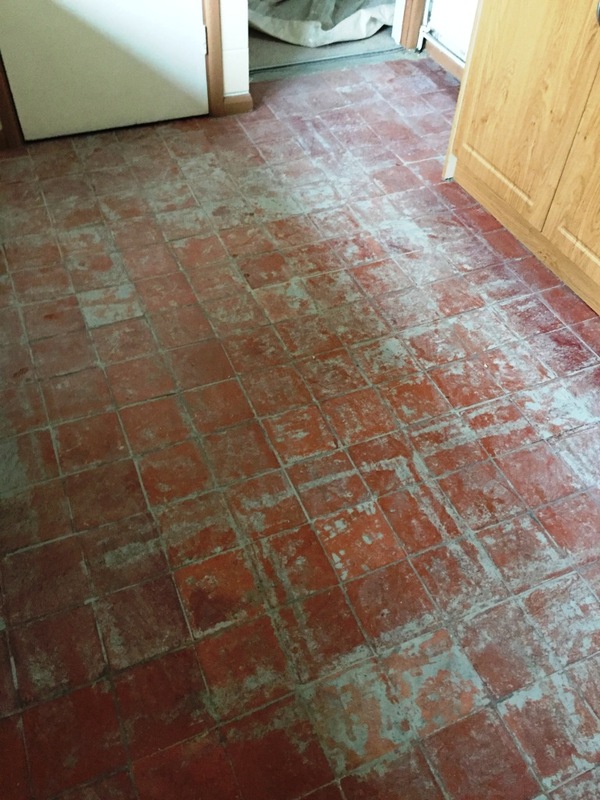 To clean the floor I realised I would need a strong cleaning solution to get these old Quarry tiles clean so I diluted Tile Doctor Pro-Clean 50:50 with Heavy Build-up Remover or Tile Doctor NanoTech HBU as we like to call it. 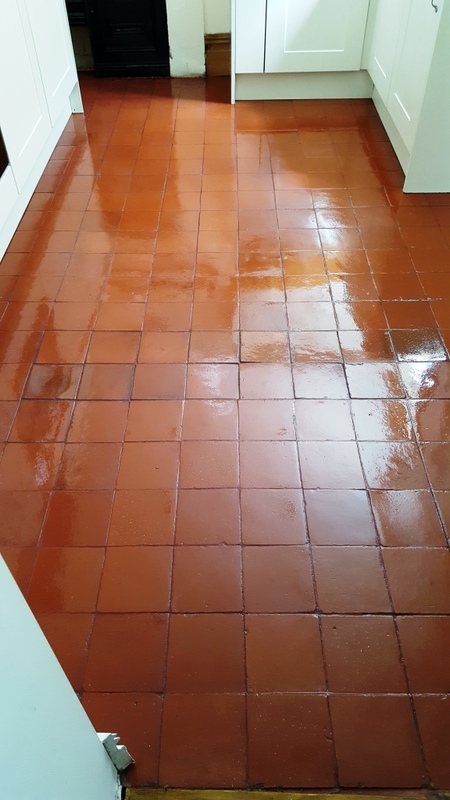 This was applied to a wet floor and scrubbed in using a scrubbing machine fitted with a coarse back pad running on slow speed. 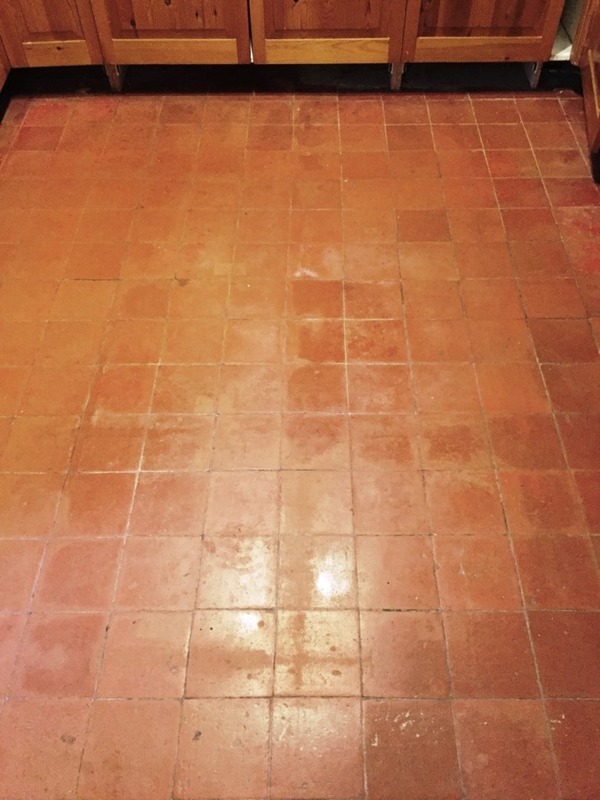 I rinsed the floor every so often so I could see the difference and discovered my choice of cleaning product has proved to be effective and fast. 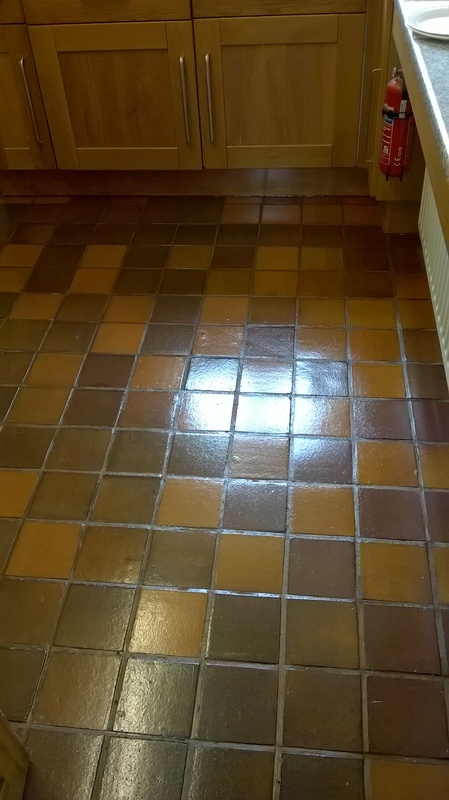 Before long I was happy to rinse away the now soiled cleaning solution satisfied that I could not improve the tiles any further with more cleaning. 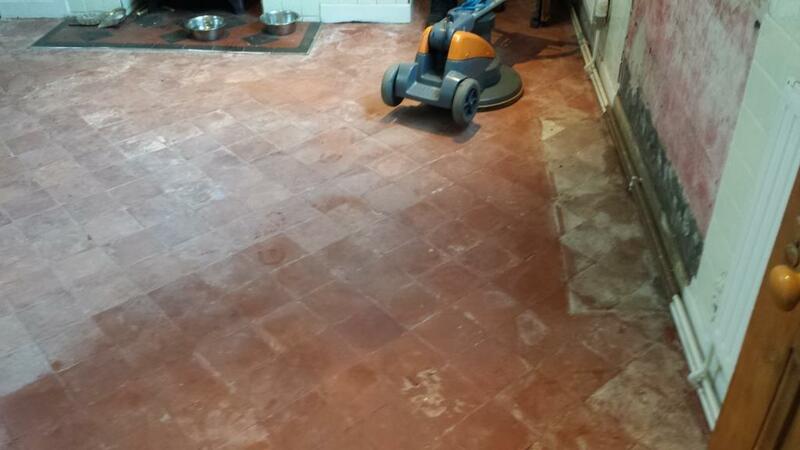 I left the floor to dry for 24h hours before returning to seal the tiles. 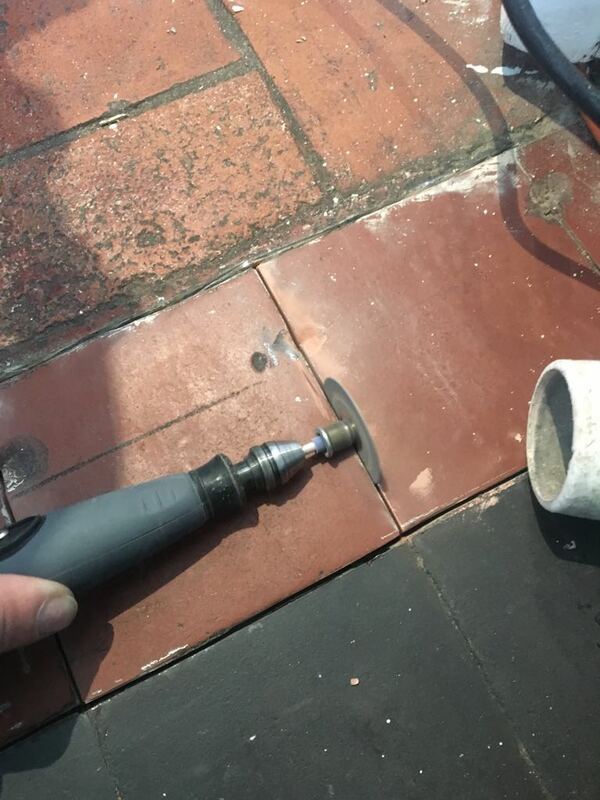 On my return I checked the moisture levels and there were some high readings so using a heat gun I applied some gentle heat to the tiles allowing them to cool before checking again. 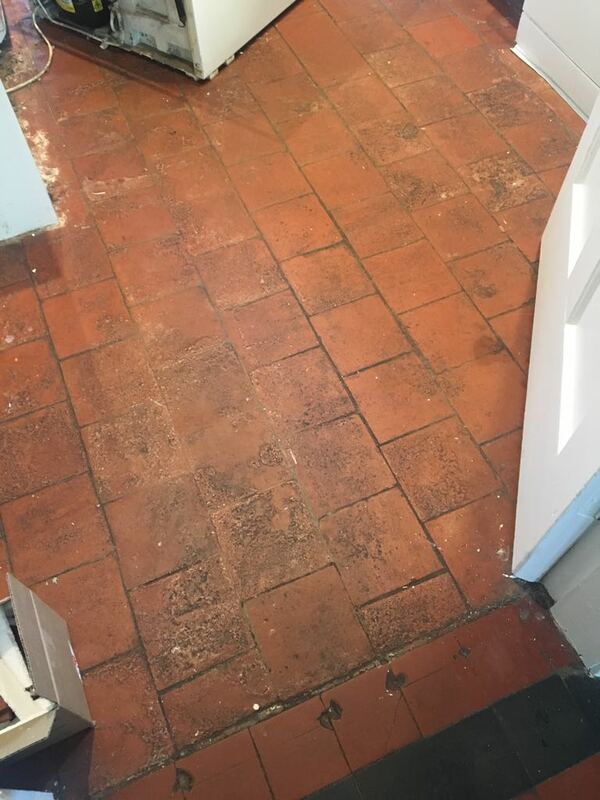 This did the trick and the second reading was much better so I proceeded to seal the tiles using Tile Doctor Seal and Go which I find works well on quarry tiles. 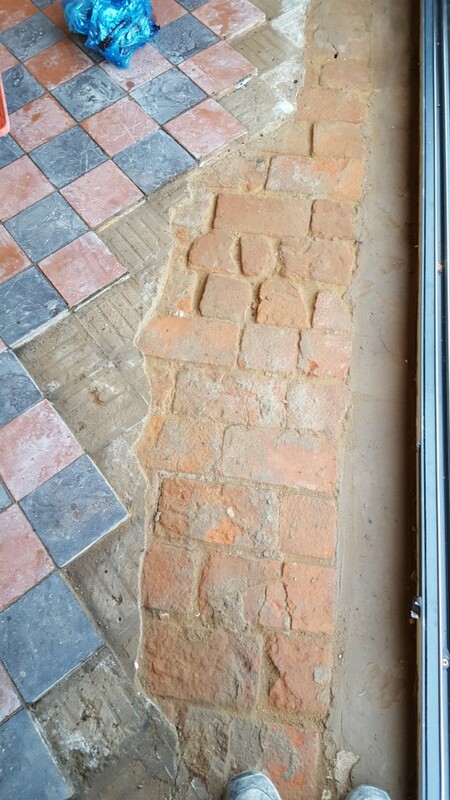 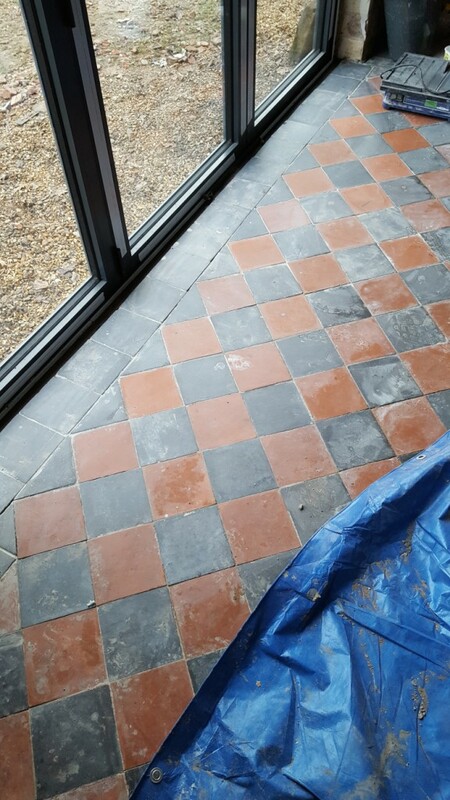 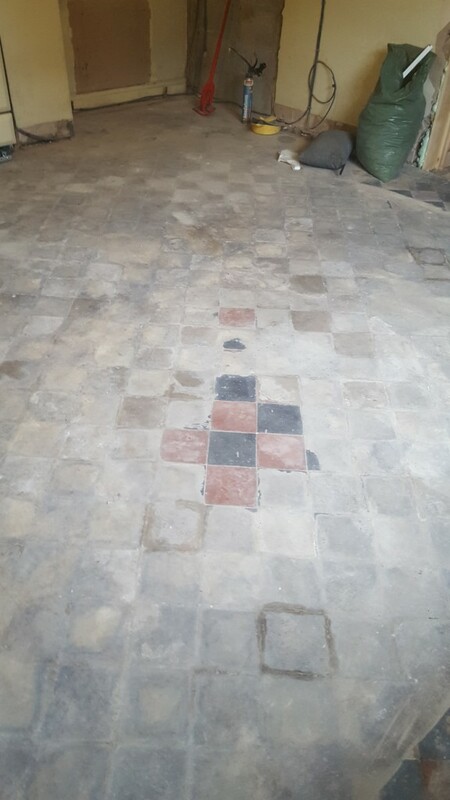 The quarry tiles were quite worn and very porous and as result needed at nine coats of sealer before they were fully sealed. 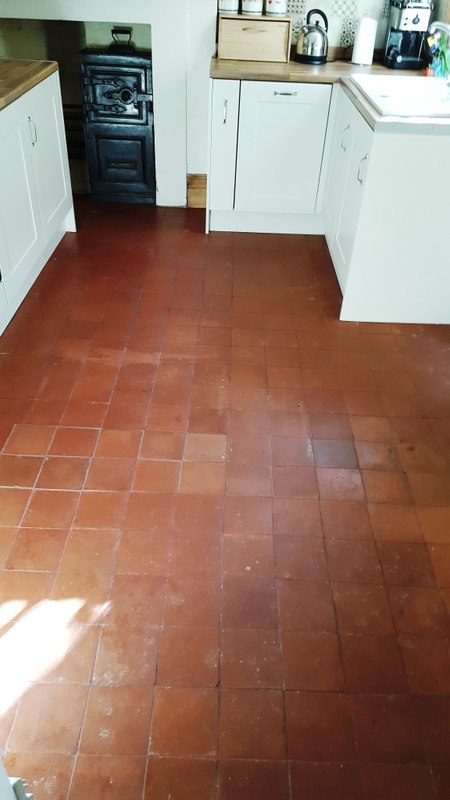 I do find multiple of coats of sealer works well on floors of this condition as it helped to hide the imperfections and marks caused by the chisel and scrapper. 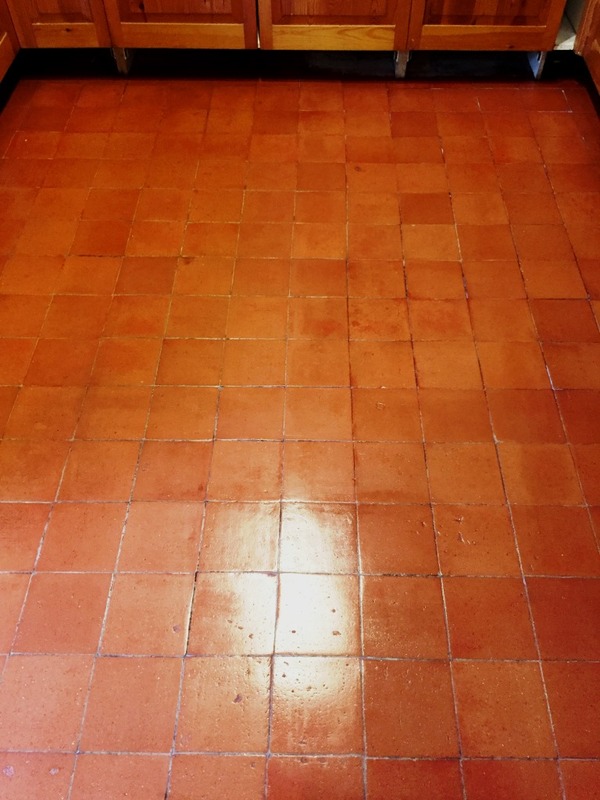 The owners were delighted with the results and asked me to come back and restore their terrazzo hallway floor which will be subject to another post.